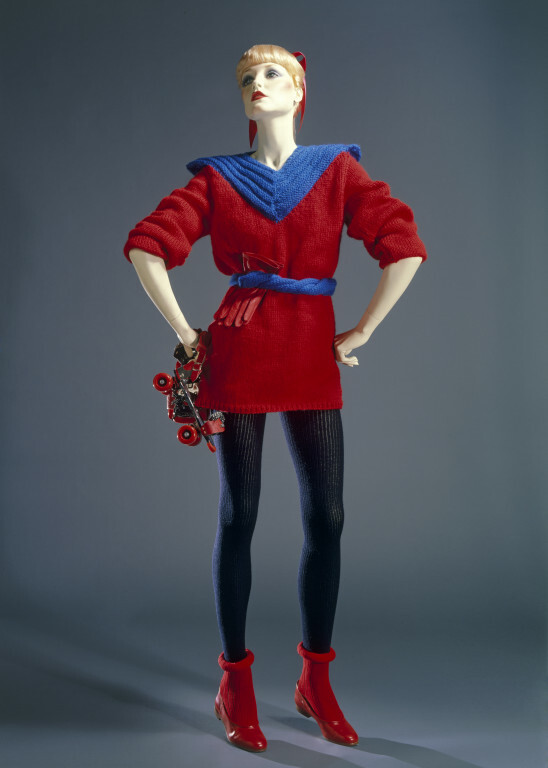 The complete ensemble was donated in 1979 with a customised Adel Rootstein mannequin specially made for the purpose of modelling it. This was part of a group of 25 such total ensembles donated in 1979. Historical significance: Roller discos were a major part of teenage socialising in the late 1970s and 1980s. They had their own special dress code. This remarkably complete outfit reflects a fashionable, co-ordinated version of a look which was made up from a number of separate components, all of which are present here. The loose-fitting thigh length sweater recalls the 'sloppy joe' of the 1950s. It is knitted mainly in stocking stitch with narrow bands of ribbing at the wrists and lower edge. The V-shaped yoke, which extends over the shoulders, is knitted in reverse stocking and garter stitches and is padded and quilted. The matching belt is simply a long strip knitted in stocking stitch. Given by Paul Howie, via Simpsons (Piccadilly) Ltd.